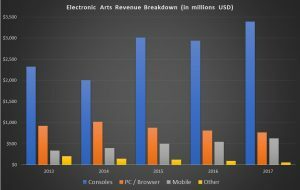 With only four months locked-in for 2018, Electronic Arts Inc. (NASDAQ:EA) already has developed a split personality. During the first two months of the year, EA stock gained a very respectable 16.5%. However, since the March 1 opening session, shares have given up nearly 6%. Which EA is going to show up, especially for its upcoming earnings report? Despite my bullishness, I must admit that Electronic Arts stock is currently stuck in a tough phase. Competitive pressures have pushed many gaming manufacturers to the wayside. For instance, chief rival Activision Blizzard, Inc. (NASDAQ:ATVI) dropped nearly 10% since the March 1 opener. Take-Two Interactive Software, Inc (NASDAQ:TTWO) is in worse shape, losing almost 12%. Obviously, the extraordinarily popular mobile game Fortnite hasn’t helped matters. Part of its popularity is due to the fact that it’s free – just download it and you’re good to go. The other part involves celebrity endorsements and that all your gaming buddies are playing. But primarily, Fortnite is addictive. The phenomenon has left EA and its rivals scratching their heads. They probably won’t have to be dumbfounded for too long. As I stated in my write-up for Activision Blizzard, Fortnite’s success largely hinges on its “Battle Royale” gaming mode. How can I say that? Because a prior Fortnite version that didn’t have this gaming mode was only modestly successful. The answer to regaining traction for EA stock is the same for its rivals: don’t reinvent the wheel but instead, make a better one. Admittedly, the Fortnite competition is worrisome whether you’re invested in EA stock or one of its competitors. That said, I think EA is better suited for this or any other challenge thanks to a very key asset: EA Sports, and particularly, the Madden NFL series. I consistently make this argument because it’s worth repeating. Sports-related video games are popular because they tap into a fantasy. The fantasy loses its magical touch, though, if only generic teams, players, and brands are incorporated. To bridge this gap between reality and virtual reality, Electronic Arts aggressively secures sports licensing deals. Thus, if you have a complaint about Madden’s gameplay, tough! You’re not going to find another NFL game to play because they don’t have the official licensing to use real players, teams, and conferences. And if you prefer college football, again, you’re out of luck. Electronic Arts owns the licensing for NCAA football as well. I previously discussed soccer’s popularity and how it potentially translates to increased sales for EA’s FIFA series. With the World Cup coming up shortly, you’re more than likely going to see a revenue boon. However, it’s American football that makes EA stock compelling as a contrarian buy on weakness. I say this because we Americans live in a football-saturated society. Just tune into sports TV. Despite the NBA playoffs running in full-swing, and an exciting baseball season underway, broadcasters are obsessed with football. Here’s a fun fact: in Shohei Ohtani, the baseball world is seeing something that hasn’t been seen in a hundred years. The last guy to go two-ways (being a star hitter and pitcher at once) was Babe Ruth. Yet we still crave football. That’s the kind of fandom for which you buy EA stock with confidence! One of the most frustrating things you can witness in baseball is leaving stranded base-runners. In other words, not all hits are the same. What separates truly great batters from the statistically impressive is situational performance. Can you hit when it matters the most? For EA stock, the answer is a resounding yes. The gaming company overall delivers solid revenue growth. However, it’s where that growth is coming from that impresses investors. In the last five years, its mobile division experienced the most lift, averaging nearly 17% annual sales growth. Consoles follow close behind at 12.3%. However, consoles make up the lion’s share of EA’s revenues, which is what you want to see. Sony Corp (ADR) (NYSE:SNE) and Microsoft Corporation (NASDAQ:MSFT) continue to duke it out in the console wars, which suits Electronic Arts stock just fine. More platforms equals more players, which translates to higher growth opportunities. Essentially, the company has a monopoly on a very lucrative subsector within the gaming world. As long as people are obsessed with sports, particularly football, I don’t see any reason to doubt EA stock. Article printed from InvestorPlace Media, https://investorplace.com/2018/05/ea-stock-sports-licensing/.